Hello! My name is Miranda and I’m a blogger from Our Nesting Place Blog. I’m so excited to be able to share one of my favorite things with you today! These little guys make wonderful gifts for friends or cute decorations for your home. They take about 5 minutes to put together from start to finish, so they’re something you can put together anytime and without a lot of hot, sweaty effort. Let me introduce to you my mini mason jar succulent starters! Like I said, these little things are so quick and easy to put together. You only need a few supplies! Again, fill your mason jar up with dirt, create a hole in the center for the succulent, remove the succulent from it’s little pot, and place inside the mason jar. place additional dirt around the succulent, and you’re done! 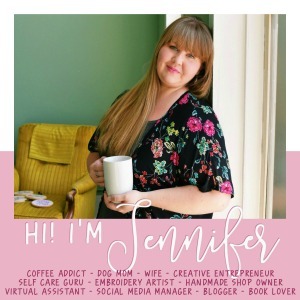 Jennifer thank you so much for letting me hi-jack your blog today! I appreciate you giving me the opportunity to share something I love with a new audience! Thanks! This is perfectly timed, as I’m transplanting some succulents on Monday! These are so cute! I love that you used Mason Jars! I am IN LOVE with these! I have so many mason jars laying around my house! Would you check them so I can pin the post? My site crashed a week or so ago and I had to switch hosts… Now I’m trying to figure out how to load all my photos :s Hopefully I’ll have it resolved shortly! Very cute! I love succulents! Next time I get some I’ll have to try this since we have some mason jars in storage. Thanks for sharing this great idea! Anything in a mason jar is absolutely adorable. Love these. Thanks for sharing this with us at the Waste not Wednesday link party. Can’t wait to see what you are up to this week. Simply adorable! Thanks for sharing at Thursday Favorite Things. Pinning! Love these adorable succulent pots! I’m so ready to get my hands in the dirt this year! Thanks for sharing your post on the Encouraging Hearts and Home blog hop! I featured your post this week at daytodayadventures.com which means I gave it some extra love on social media! Make sure you come link up today! Have a great week! These look really wonderful together. I love the picture with the green background, it looks so Spring very pretty. Pinning. Very cute–I love succulents and Mason jars! Pinned and tweeted. I love this idea. I’m a huge fan of succulents and I’m always looking for ways to reuse jars that we use in the kitchen so this is perfect! This is so darling. What a great idea! Thank you so much for sharing the know how and the adorable Mason jars with the succulents. I have a kitchen window where I’d love to have them to admire them ! Just adorable! I’m visiting from Home and Garden Thursday. Would LOVE to have you join us at Homestyle Gathering!